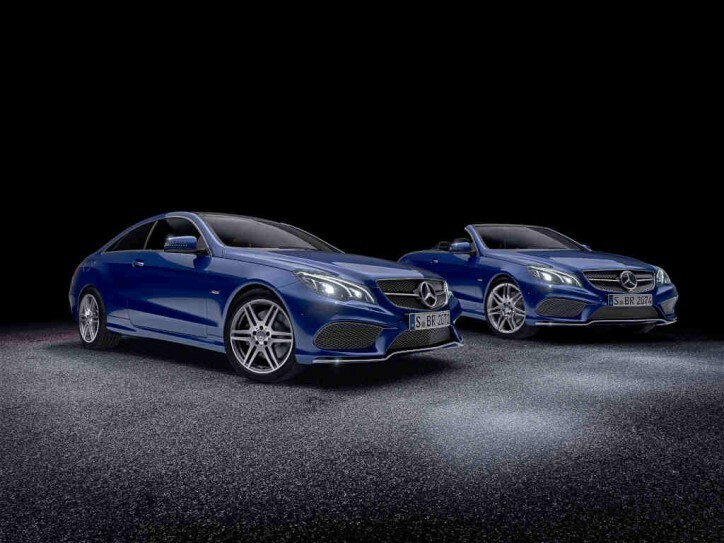 The Mercedes-Benz E-Class Coupe and Cabriolet will each receive the Sport and V8 Edition models. The media room of Daimler just announced not one, but two special models of the Mercedes-Benz E-Class Coupe and Cabriolet. The two limited edition models are called the Sport Edition and V8 Edition. This edition gets a revised apron with a more striking air intakes, restyled radiator grille that comes with chrome inserts, muscular side sill panels, and distinct spoiler lip. Going around the rear will reveal a redesigned diffuser, and trapezoid-shaped exhaust tips. Moreover, it comes with the AGILITY CONTROL sports suspension, 18-inch AMG light alloy wheels, new brake discs and calipers, Sport Edition badges, and blue metallic paint finish. The interior is adorned with black leather carrying the same sporty theme as well as silver shift paddles, foot pedals, and nappa-wrapped steering wheel. Buyers can also choose among the different themes namely the high-gloss black ash, black piano lacquer or dark textured-grain aluminium to provide more personality to the cabin. This edition ups the ante a bit. It is offered in selenite grey metallic and designo diamond finishes with 19-inch AMG wheels. Then in addition to the other features found in the Sport Edition, the V8 Edition has a 4-way lumbar support and Memory package, PRE-SAFE positioning function, THERMOTRONIC auto climate control, plus nappa leather upholstery with porcelain or red with black accents for the controls like steering wheels, paddle shifts, and foot pedals. The Mercedes-Benz E-Class Coupe and Cabriolet Sport and V8 Edition models are equipped with various infotainment system integration for smartphones running on either iOS and Android.